As we’ve talked with our learners about their career goals over the past few years, we’ve noticed a theme. Many of you say that you know where you want to go in your career, but aren’t sure what you need to learn to get there; or that you’ve taken one course in a field you’re interested in, but aren’t sure what to take next. That is why we are introducing step-by-step learning paths to help our learners jump start a new career. New learners who tell us that their goal is to start a new career will be shown a complete guide to that career including what skills they need to know, the sequence of courses that teach those skills and even pre-requisites needed to successfully master the skills. 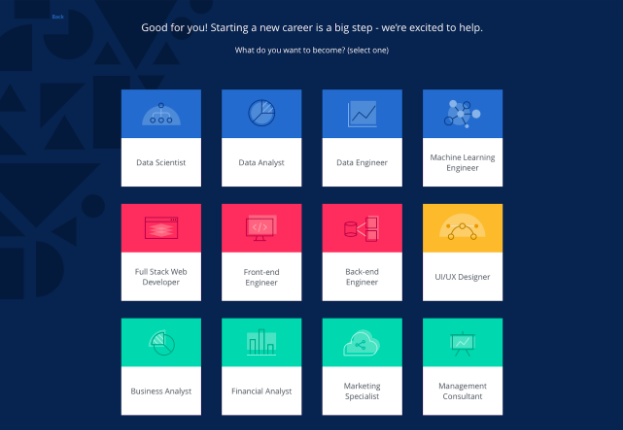 We now have learning paths for many of the highest growth jobs like data scientist, full stack developer, marketing specialist, machine learning engineer, UI/UX designer and many more. We built upon our earlier skills tagging work in our catalog of 2000+ top university and industry taught courses to identify the courses that are most relevant to particular career goals. Our industry experts then designed step-by-step plans to guide learners on the most efficient path towards their goals. You can choose among many types of careers by signing up on Coursera. Learning paths are designed to take six months to a year to complete. However, once you choose a path, you can customize it by skipping courses that teach concepts you’re already familiar with, and by choosing from different sub-specialty tracks. Each path includes a variety of beginner, intermediate, and advanced courses, so you can start from any level. Learning paths will soon be available for all learners but are currently only available in English and for new learners who sign up on our platform. If you are considering signing up on Coursera to get started in a new career, we can help you be on your way today. Register on Coursera and share your career goals to get started!